A1185 modle white battery is design for 13 inch MacBook Pro(2006, 2007); support 3 hours for general writing, easy to install with necessory screwdrivers, wish you have a great shopping experience! About ARyee: ARyee is a professional production, offers high quality laptop batteries, chargers more than 10 years, high quality assurance! Work for 2007 13 inch MacBook Pro, 2006 Macbook. 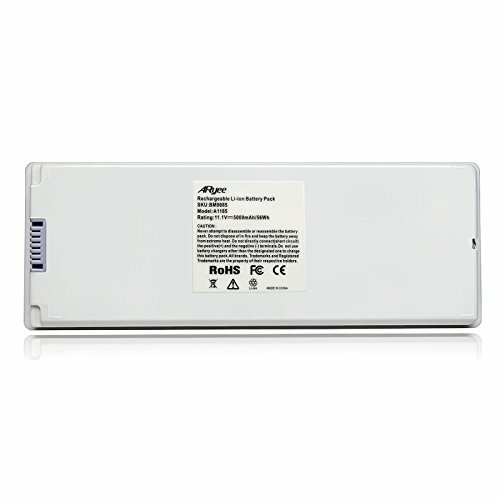 Work with 13-inch MacBook Pro(2007, 2006), fit battery model: A1185; compatible: MA561, MA561FE/A, MA561G/A, MA561J/A, MA561LL/A. 100% New brand replacement, 5000mAh/56Wh, 800 recharge cycles, 11.1V(compatible with 10.8V). Grade A cells ensure fast charges and low power consumption; Built-in circuit protection ensures both safety and reliability. Installed easily with our necessory screwdrivers, you could find free installing video in Yourube. 18 months warranty, 30 days return or money refund, buy with confidence! If you have any questions about this product by ARyee, contact us by completing and submitting the form below. If you are looking for a specif part number, please include it with your message.